I've always liked to read, and I'll read just about anything: the back of cereal boxes; prescription instructions; bibliographies on the bottom of a research paper; and the fine print on legal documents. If it has words, you will find me reading them. My passion for reading stems from my parents, who were both school teachers. My mother taught kindergarten and 1st grade, while my father taught mathematics and earth science. Education has always been important in our family, and reading just goes along with it. I have a huge library of books of all types. 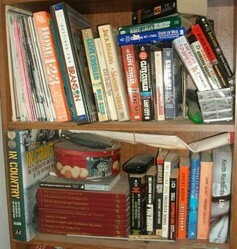 Most are fiction and memoirs, but I do have some reference books, poetry, "how-to" and recipe books. These books are all over my house: on book shelves, on the television stand, beside my chair, and under my bed. I also have boxes of books in my storage shed! I probably should sell them to Half-Price Books or online, but then I wouldn't be able to re-read them! I much prefer to have a book that I can hold in my hand, as opposed to online or a Kindle. I like the feel of paper, and enjoy being able to turn the page. Plus, it's just easier on my eyes! Come Quick, Rodger's Had a Fit! Do you have suggestions on what I should read next? Please post in the comments section at the end. I like fiction, because it doesn't require much thought. These are the type of books I read out in the yard, or when I want to wind down at the end of the day. It can be any type of novel: science fiction, mystery, or just something really silly. I'm not too fond of romance novels or Westerns, but if there is nothing else to read, these will do in a pinch. It doesn't really matter what the plot is, or who the characters are. I just enjoy a story that has a tiny bit of substance and not too much technical knowledge. Farm Show Magazine is a really interesting publication because the articles are written by every day people, showcasing their ideas and inventions. These writers share ideas on how to make life more interesting and exciting, or an easier way to do a task. For example, one inventor came up with the "Dandelion Dobber", which is a pole that applies weed killer directly to the plant. (I actually purchased one of these, and it works wonders!) It is really amazing the things these farmers come up with! Backyard Poultry covers all types of birds: chickens, ducks, geese, guineas and game birds. There are always great photos that readers have submitted of their feathered friends, and articles on their care, health and feeding. I would like to think that I already know everything there is to know about poultry, but I always learn something new! I actually keep all back issues of this magazine, and refer to them often. I tend to gravitate towards books about war, especially Vietnam. My husband was a combat vet who served from 1969-1972 in Vietnam. While he already had quite a few reference books and videos in his collection, I really enjoy the first-hand accounts. 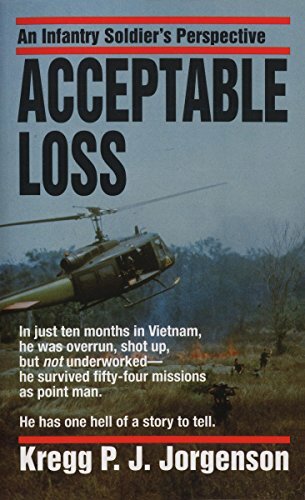 Acceptable Loss is written by a former infantryman, and is quite an interesting view into daily life during the war. Besides magazines, fiction and Vietnam stories, I like biographies, books on medical issues, and cookbooks. I was diagnosed with thyroid cancer in 1999, and have a few books on thyroid cancer and treatments in my library for reference. As for cookbooks: A person can never have too many cookbooks! 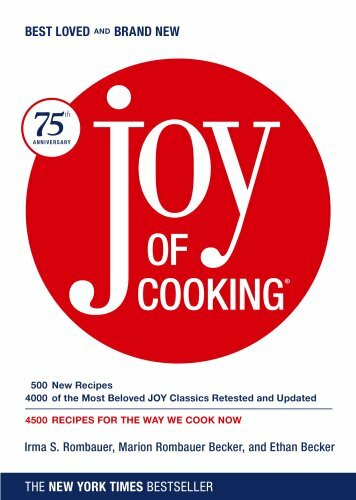 I still have the original copy of "The Joy of Cooking" that I received for my birthday in 1981. I also enjoy books that provide a bit of history, or provide inside views on people. "Come Quick! Rodger's Had A Fit" was written by George Dolan, a former columnist for the Fort Worth Star-Telegram. This book, which was printed in 1970, is a series of funny incidents and pranks that Mr. Dolan reported on in his newspaper column. I remember reading those columns when they came out, so it's quite enjoyable to read them again 40 years later. I've heard that in the future, books will disappear, and we will all be reading on smart phones, iPads and computer monitors. Some newspapers have already disappeared and book storefronts have shut down. I hate to think the printed page might be replaced as well. But just in case they do become obsolete, I am comforted in the fact that I am surrounded by a multitude of books, so I'll always have something to read! Copyright L.C. Clifton / Country Sunshine. All Rights Reserved. Originally published January 31, 2012 on Squidoo. What do you think? Will books disappear? Well I have an ereader and I still buy "real" books as well! I think the new doesn't always replace the old, often it just adds another form of enjoyment to life.